THE #1 GREATEST STAR WARS MOVIE POSTER SALE ANYWHERE IN THE WORLD!! THE ULTIMATE STAR WARS MOVIE POSTER COLLECTION!!!!!!!!!!!!! May the force be with you!!!!!!!!!!!!!!!!! This world famous collection of original movie posters has no equal. It's by far the single greatest Star Wars poster collection to ever be offered for sale ANYWHERE! Just look at the list of posters. You can immediately see why this collection boasts of being the reference to all the others. Much more than just a collectible, Star Wars poster collecting has become a cultural movement. 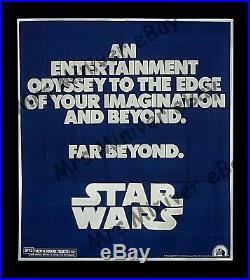 Started back in 1977 as a bi-product of the sensation of the film, Star Wars poster collecting swept the nation, and, has continued on forward momentum for over forty years now. Lucasfilm, known as The Star Wars Corporation at the time, launched the entire Star Wars enterprise with that poster. Just think of how many Star Wars products have been manufactured since! I'd bet it's well over half a million different things. Yes, it was a poster that was at the start of America's love affair with Star Wars. What drives the quest towards acquisition for so many collectors who love Star Wars? Much of the success of the film was in that it touched a cord of spirituality throughout most of the population of people who saw it. Even stronger, it triggered an awakening inside of its followers (now, over five hundred million strong). It's an awakening connected to a person's need to dream - as in striving for betterment. Ever since the film's historic 1977 release, the public has yearned for another movie to come along which can deliver that same uplifting effect. Four decades later, most of us are still yearning. In the meantime, ownership of the original posters, thru nostalgic means, brings us back to that nice place filled with hope and importance. The Star Wars poster movement has created and carried an entire industry of poster sellers - right from the beginning of the summer of 1977 straight through until now - with no end in sight. There would be no "movie poster business" without Star Wars. Today, well into the 21st Century, movie posters are so heavily collected that BY FAR the vast majority of them are. Made to promote the film or to hang in the cinemas - most are printed for direct resale to the public. The posters contained within this collection were not issued that way, they were made for advertising purposes only , and so most of them are extremely rare. Movie posters are a relatively "new" collectible. The collecting of stamps and coins, as well as hoarding of comics and trading cards, are well "established" or "accepted" as fiscally responsible avocations for the invested. They've been around significantly longer than the movie poster - at lease half a century longer! The potential for growth in this relatively new and young field of advertising posters is unlimited. The Star Wars Reference Collection represents the finest posters offered worldwide. It's arguably the finest collection of ANY KIND available for any price anywhere. 1 - Special Advance "Odyssey" style Teaser 7-Sheet Billboard (see photos #1 & 2). 2 - Special May 25th release date second advance Teaser 70mm Billboard (see photo #3). 3 - THE GRANDDADDY of ALL Star Wars posters: The Style "D" 7-Sheet Billboard (see photo #1). 4 - 24 Sheet Billboard Tom Jung Art Approx. 9x20 feet (see photo #4). 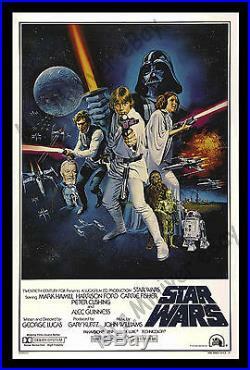 5 - Empire Strikes Back 8-Sheet Style "A" made for the 1980 Film Premiere - RECALLED NEVER DISTRIBUTED (see photos #1 & 10). There are hundreds of different posters in this collection with a remarkably high number of "Holy Grail" masterpieces, including, the never released and nearly impossible to find 1978 John Williams Concert poster. But in this collection that's just peppering. The Star Wars Reference Collection offers TRULY impossible treasures, such as The Empire Strikes Back eight-sheet "Premiere" style (one of three that were made and only two that have survived), and, the extremely rare 1977 seven-sheet advance "Odyssey" style. This is the fist Star Wars billboard - And this is ONLY the beginning! This collection has EVERYTHING, including THE GRANDDADDY of ALL Star Wars posters: The 1978 Style "D" 7-sheet!! ONLY two (2) collections in the world are known to have this essential one, and that includes the Lucasfilm Archive. Needless to say, this collection has all the coveted original one sheets, including the Mylar advance, Birthday, Both Revenge of the Jedi advance 1-sheets, and, a staggering list of posters that include more Star Wars than in the heavens. In recent years there have been a number of individual movie posters to sell for nearly what I'm asking for this entire collection , and that is just for ONE poster. 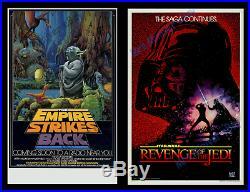 This collection: THE #1 GREATEST STAR WARS MOVIE POSTER SALE ANYWHERE!!! Is RARER and far more important than any of those individual big sellers. 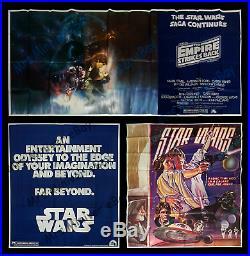 THE #1 GREATEST STAR WARS MOVIE POSTER SALE ANYWHERE!! The following is a list of all the ORIGINAL posters in this offering. Special Advance "Odyssey" style 7-sheet 91x84 inches. Special May 25th release date second advance 7-sheet 91x84 inches. 24-sheet Tom Jung Art Approx 9x20 feet (see photo #2). Silk Banner 1977 26 inches x 104 inches, silkscreen. The Howard Chaykin Poster AKA Star Wars Poster Number 1 1976 29 inches x 20 inches ROLLED. Advance Star Wars Corp Flyer 1976 8-1/2 inches x 11 inches Given out at 1976 Sci-Fi Conventions offering the Chaykin Poster. Advance Teaser "Mylar" One-Sheet 1976 27x41 inches ROLLED. Advance Teaser "Silver and Black" One-Sheet 1976 27x41 inches ROLLED. Style "A" One-Sheet 1977 27x41 inches ROLLED (NSS # 77/21-0) Considered 1st printing - But not proven (as). 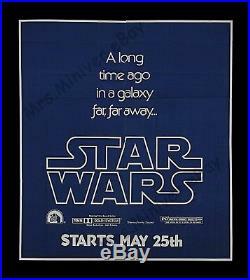 Style "A" One-Sheet 1977 27x41 inches ROLLED (NSS # 77/21 with STAR WARS written underneath #). Style "A" One-Sheet 1977 27x41 inches ROLLED (NSS # 77/21 with NO STAR WARS underneath #). Style "A" One-Sheet 1977 27x41 inches FOLDED (NSS # 77/21 with NO Style "A" written on border). Style "A" One-Sheet 1977 27x41 inches ROLLED (FOX RECORDS VERSION - Enlarged soundtrack area at bottom). 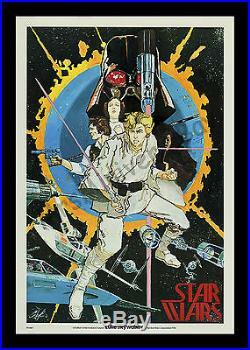 Style "A" One-Sheet 1982 27x41 inches ROLLED (VIDEO - NSS # 77/21 HARDSTOCK PAPER - LUCASFILM). Style "A" One-Sheet 1977 27x41 inches ROLLED International (No PG Box) test Print (NSS # 77/21-0). Hildebrandt Bilingual US/INTERNATIONAL One-Sheet 1977 27x41 inches FOLDED - US Printed for Spanish speaking markets. Hildebrandt Bilingual US/INTERNATIONAL One-Sheet 1977 27x40 inches FOLDED - As above but 1-inch shorter (different printing). Style "B" Teaser One -Sheet 1977 27x41 inches ROLLED (NSS - GAU). Teaser "Spanish" US/INTERNATIONAL One-Sheet 1977 27x41 inches TRI-FOLDED - US Printed for Spanish speaking markets. Style "C" US/INTERNATIONAL One-Sheet 1977 27x41 inches ROLLED (No PG Box) For overseas distribution. Style "C" Spanish Language US/INTERNATIONAL One-Sheet 1977 27x41 inches FOLDED - US Printed for Spanish speaking markets. Style "C" PG One-Sheet 1977 1977 27x41 inches ROLLED - RARE PG BOX VERSION For US domestic market. Style "D" One-Sheet 1978 27x41 inches ROLLED - RARE NSS 770021 ROLLED VERSION (Only 4 collectors known to have this). Style "D" One-Sheet 1978 27x41 inches ROLLED - FOX VERSION. Style "D" One-Sheet 1978 27x41 inches ROLLED - FOX RECORDS VERSION (Soundtrack Oval). 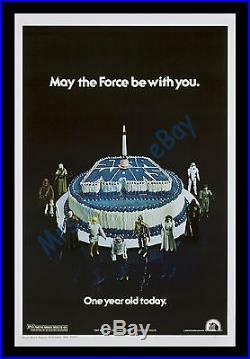 Star Wars Happy Birthday One-Sheet 1978 27x41 inches ROLLED - Issued May 25 1978 - Displayed for one day! Star Wars Concert Poster 1978 37 x 24 1/2 inches ROLLED - Artwork by John Alvin - never released - Symphonic suite by John Williams. Six-Sheet Style "A" 1977 77x79 inches FOLDED (printed in two sections). Three-Sheet Style "A" 1977 41x77 inches FOLDED. Portrait Lobby poster (Bleed - No white border) 37 1/2 x 34 inches 1977 ROLLED FOX ISSUE - FOX Stamp & 1977 date on back. Set of 2 - 20 x 30 inch lobby cards (Bleed - No white border) 1977 FOX ISSUE - FOX ISSUE - FOX Stamp & 1977 date on back. Set of 4 - 16 x 20 inch lobby cards (Bleed - No white border) 1977 - FOX ISSUE - FOX Stamp & 1977 date on back. Set of 8 11 x 14 lobby cards (Bleed - No white border) 1977 - FOX ISSUE - FOX Stamp & 1977 date on back. Set of 8 - 8 x 10 inch lobby cards (Bleed - No white border) 1977 - FOX ISSUE - FOX Stamp & 1977 date on back. Insert Display 1977 14 x 36 inches ROLLED NSS. Half Sheet Display 1977 22 x 28 inches ROLLED NSS. 30 x 40 inch Display Style "A" 1977 ROLLED NSS. 30 x 40 inch Display Style "D" 1978 ROLLED NSS. 40 x 60 inch Premium Deluxe Display Style A 1977 ROLLED NSS. 40 x 60 inch Premium Deluxe Display Style D 1978 ROLLED NSS. Lobby card set of 8 1977 11 x 14 inches NSS 77/21-0 (1st NSS printing). Lobby card set of 8 1977 8 x 10 inches NSS 77/21-0 (1st NSS printing). Advance Mini Window poster 1977 - 7 1/2 x 6 3/4 inches ROLLED. Advance Mini Window poster 1977 - 9 1/2 x 7 1/2 inches ROLLED. Mini window poster 1977 - 10 x 8 inches ROLLED. Original Pressbook 1977 (dated 1976) 8-1/2 x 11. Original Press Kit 1977 Folder of info & bios & 8x10 stills given to press & industry. FOX - FOR SEVENTY SEVEN BOOK - FILM INDUSTRY ONLY 1976 10x14 inches. Exhibitor's Book (with original box) 1977 11x14 inches 26 pages - Deluxe program sent to press and industry only. Theater Program Book 1977 9 x 11 3/4 inches. Counter Top Display 1977 9 x 6 inches Hildebrandt artwork - Used to advertise the program and merchandise at theaters. Star Wars VADER Mylar Soundtrack Advertising ONLY poster 1977 Approx. 33 x 22 inches ROLLED. 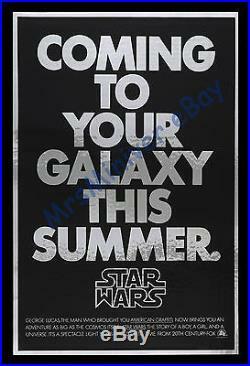 Star Wars BERKEY Soundtrack Advertising ONLY poster 1977 Approx. 33 x 22 inches ROLLED (folded version given W/Soundtrack). The Story of Star Wars Soundtrack Advertising ONLY poster 1977 Approx. It's Back One-Sheet, with Kenner Toy discount book 1979 27x41 inches ROLLED - FOX VERSION (Bleed - No white border). It's Back One-Sheet It's Back One-Sheet 1979 27x41 inches FOLDED - NSS VERSION (Bleed - No white border). It's Back One-Sheet 1981 27x41 inches ROLLED - FOX VERSION. It's Back One-Sheet 1982 27x41 inches ROLLED - FOX VERSION. It's Back One-Sheet 1982 27x41 inches ROLLED - NSS VERSION. It's Back Insert Display 1981 14 x 36 inches ROLLED NSS. It's Back Half Sheet Display 1981 22 x 28 ROLLED NSS. It's Back Insert Display 1982 14 x 36 inches ROLLED NSS. It's Back Half Sheet Display 1982 22 x 28 inches ROLLED NSS. It's Back 30 x 40 inch Display 1982 ROLLED NSS. It's Back 40 x 60 inch Premium Deluxe Display 1982 ROLLED NSS. 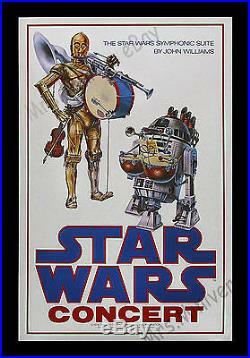 Star Wars 10th Anniversary GOLD Mylar One Sheet 1987 27x41 inches ROLLED. THERMOS - LUNCH-KIT Advertising Poster 1977 20 x 28 inches FOLDED. Don Post Star Wars Masks Advertising Poster 1977 18x 25 inches ROLLED. Toyota Celica - Star Wars Car Contest Advertising Poster 1977 11 x 14 inches (with Wonder Bread Card offer mentioned). 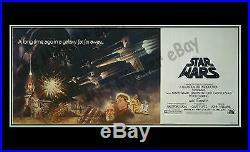 Hardware Wars Advertising Poster 1977 11x17 inches Short film spoof on Star Wars. Topps Star Wars Trading Cards Advertising Poster Sheet 1977 (1st series) ROLLED. Frozen Coke Star Wars Cups Advertising Poster 1977 24 x 36 inches. Frozen Coke Star Wars Cups (Hildebrandt) Advertising Mobile 1977. Frozen Coke Star Wars Window Decal Poster 1977 5 x 5 inches. Star Wars Coke Glasses Advertising Mobile 1978. Star Wars (set of 3) Coke Poster Advertising Mobiles 1978. Star Wars Coke Glasses Translight Advertising Poster 1978 24-3/4 x 27-5/16 inches. US Department of Heath Advertising Poster 1979 14 x 22 inches ROLLED. Star Wars Exclusively On National Public Radio Advertising Poster 1981 29 x 17 inches ROLLED. CENSORED Alien Cantina Poster - RARE 1978 20 x 28 inches ROLLED. Hildebrandt British Quad - RARE 1977 30 x 40 inches. STYLE "C" British Quad (NO AA) 1977 30 x 40 inches. STYLE "C" British Quad (AA version) 1978 30 x 40 inches. ITALIAN 1977 39 x 55 inches FOLDED. Eight-Sheet Style "A" made for 1980 FILM PREMIER Only 2 known to exist! RECALLED 5 feet x 11 feet. Advance VADER Teaser One-Sheet 1979 27x41 inches ROLLED. Advance VADER Teaser "Spanish" US/INTERNATIONAL One-Sheet 1980 27x41 inches FOLDED - US Printed for Spanish speaking markets. Style "A" One-Sheet 1980 27x41 inches ROLLED. Style "A" US/INTERNATIONAL One-Sheet 1980 27x41 inches FOLDED (No PG Box) For overseas distribution. Noriyoshi Ohrai "Spanish" US/INTERNATIONAL One-Sheet 1980 27x41 inches FOLDED - (ONLY US POSTER W/Ohrai ART). Style "B" One-Sheet 1980 27x41 inches ROLLED FOX. Style "B" One-Sheet 1980 27x41 inches ROLLED NSS. SUMMER One-Sheet 1981 27x41 inches ROLLED. REISSUE One-Sheet 1982 27x41 inches ROLLED. Two-Sheet Style "A" ADVANCE (with coming date) made for NYC Transit Systems 1980 45 x 58 inches ROLLED. Two-Sheet VADER Style ADVANCE (with coming date) made for NYC Transit Systems 1980 45 x 58 inches ROLLED. Three-Sheet VADER ADVANCE 1980 41x77 inches FOLDED. Six-Sheet VADER ADVANCE 1980 77x79 inches FOLDED (printed in two sections). 40 x 60 inch Style "A" Premium Deluxe Display 1980 ROLLED NSS - RECALLED. 40 x 60 inch Style "B" Premium Deluxe Display 1980 ROLLED NSS. 30 x 40 inch Style "B" Display 1980 ROLLED NSS. ADVANCE VADER EMBOSSED BLACK BOX With 2 Ralph McQuarrie prints 1979 22 inches x 9-1/2 inches. Original Pressbook 1980 8-1/2 x 11. Original Press Kit 1980 Folder of info & bios & 8x10 stills given to press & industry. Portrait Lobby poster (Bleed - No white border) 37 1/2 x 34 inches 1980 ROLLED. Set of 3 - 20 x 30 inch lobby cards (Bleed - No white border) 1980. Set of 4 - 16 x 20 inch lobby cards (Bleed - No white border) 1980. Set of 8 11 x 14 lobby cards (Bleed - No white border) 1980. Insert Display Style "A" 1980 14 x 36 inches NSS RECALLED. Insert Display Style "B" 1980 14 x 36 inches NSS. Half Sheet Display Refreshment Stand Style Only 2 known to exist! 1980 22 x 28 inches FOX Issue for Chinese Theater. Half Sheet Display Style "A" 1980 22 x 28 inches ROLLED NSS RECALLED. Half Sheet Display Style "B" 1980 22 x 28 inches ROLLED NSS. Set of 8 11 x 14 lobby cards 1980 - NSS. Set of 8 8 x 10 lobby cards 1980 - NSS. John Williams Soundtrack Advertising ONLY Mobile 8-TRACK! John Williams Soundtrack Advertising ONLY poster 1980 36x36 ROLLED VADER. John Williams Soundtrack Advertising ONLY poster 1980 24x36 ROLLED VADER. John Williams Soundtrack Advertising ONLY Display 1980 24x36 STORMTROOPER (RED). John Williams Soundtrack Advertising ONLY poster 1980 24x36 ROLLED FOUR-ALBUMS. Empire Strikes Back - YODA National Public Radio Advertising Poster 1982 28 x 17 inches ROLLED (Ralph McQuarrie art). STYLE "B" British Quad 1980 30 x 40 inches FOLDED. Original British Pressbook 1980 VADER COVER. Dixie Cup Advertising Only Poster 1980 15 x 21 inches ROLLED. Vymura CLOUD CITY SPECIAL One Sheet 1980 31-1/4 x 42 inches ROLLED. Advance Teaser One-Sheet 1982 27x41 inches ROLLED (NO-DATE). Advance Teaser One-Sheet 1982 27x41 inches ROLLED (With May 25 Coming Date). Advance Teaser "Spanish" US/INTERNATIONAL One-Sheet 1982 27x41 inches FOLDED - US Printed for Spanish speaking markets. Exhibitor's Book 1982 - Deluxe spiral bound program sent to press and industry only WITH REVENGE TITLE. Style "A" One-Sheet 1983 27x41 inches ROLLED NSS. Style "A" US/INTERNATIONAL One-Sheet 1983 27x41 inches TRI-FOLDED (No PG Box) For overseas distribution. Style "A" Spanish Language US/INTERNATIONAL One-Sheet 1983 27x41 inches FOLDED - US Printed for Spanish speaking markets. Style "B" Test Proof One-Sheet 1983 (dated 1982) 28x41 inches ROLLED FOX. Style "B" One-Sheet 1983 27x41 inches ROLLED NSS. Style "B" One-Sheet 1983 27x41 inches ROLLED FOX. Style "B" US/INTERNATIONAL One-Sheet 1983 27x41 inches TRI-FOLDED (No PG Box) For overseas distribution. Style "B" Spanish Language US/INTERNATIONAL One-Sheet 1983 27x41 inches FOLDED - US Printed for Spanish speaking markets. 40 x 60 inch Style "A" Premium Deluxe Display 1980 ROLLED NSS. ADVANCE Out-Of-Home Three-Sheet Style "B" 1983 42x84 inches. Original Pressbook 1983 8-1/2 x 11. Original Press Kit 1983 Folder of info & bios & 8x10 stills given to press & industry. Set of - 20 x 30 inch lobby cards (Bleed - No white border) 1983. Set of 11 - 16 x 20 inch lobby cards (Bleed - No white border) 1983. May 25th COMING ADVANCE 1983 21-1/2" x 29-1/2". Half Sheet Display Style "A" 1983 22 x 28 inches ROLLED NSS RECALLED. Half Sheet Display Style "B" 1983 22 x 28 inches ROLLED NSS. The Jedi Adventure Center Half Sheet Display 1983 22 x 28. 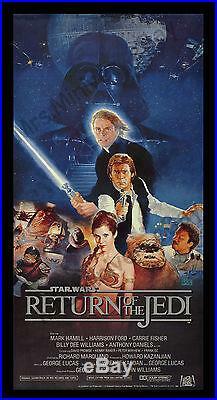 Return of the Jedi Soundtrack Advertising Only Poster - With Star Wars & Empire (1st US Trilogy Poster) 1983 ROLLED. YODA READ Library Advertising Only Poster 1983 22x34 inches ROLLED. Re-Issue One -Sheet 1985 27x41 inches ROLLED. Jedi Arena Atari Advertising Only Poster 1983 23x36 inches ROLLED. Burger King Jedi Glasses - VADER Standee 1983 Life Size. Jedi ADVANCE British Quad (Similar to REVENGE art) 1983 30x40 ROLLED. The Ewok Adventure ABC TV Advertising Only Poster 1984 25-1/2 x 33. Caravan of Courage: An Ewok Adventure Style "A" One-Sheet 1984 27x41 inches ROLLED. Caravan of Courage: An Ewok Adventure Style "B" One-Sheet 1984 27x41 inches ROLLED. CONSIDERED BEST IN THE WORLD. See my other listings for other great Film Poster opportunities - Please write with any questions. May The force be with you!!!!!!!!!!!!!!!! It can crash regardless of any decision you make and can even crash regardless of any decision made by the company related to the stock - Leaving you with a near worthless piece of paper that won't inspire anyone! The magnificence of art and historic documents have an inherent value that relates to civilization and society. This poster collection is definitely. The item "THE STAR WARS MOVIE POSTER REFERENCE COLLECTION! VOTED #1 OFFERING WORLDWIDE" is in sale since Saturday, February 2, 2019. This item is in the category "Entertainment Memorabilia\Movie Memorabilia\Posters\Originals-United States\1970-79".miniver" and is located in Studio City, California.